For more information on how to create Facebook Pages, see this helpful article. Click the OK button and you are ready to go. Photos will be uploaded and posted to your Page's Sparkbooth album (which you can rename) at the end of each photo session. This is a beta feature so please let me know how it works for you and if you have any suggestions. 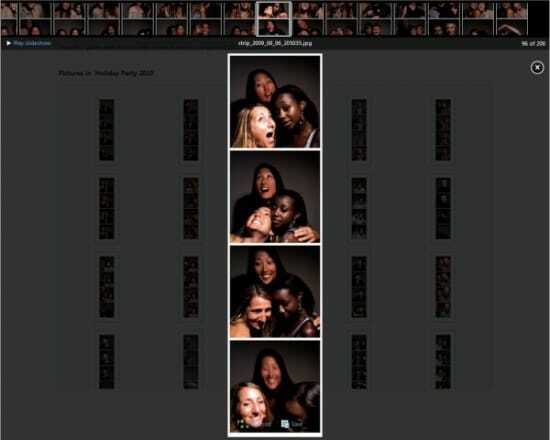 Having trouble customizing a photo layout template for Sparkbooth? Send Harry an example of the layout you want customized and other images you want on your photo, and he will create your template for a small fee. You can check out samples of his work here. Please contact Harry at harry@hg-entertainment.com. 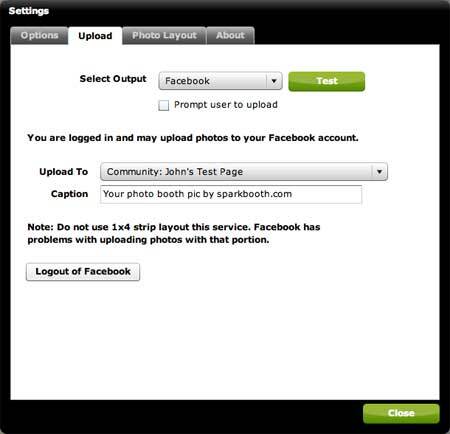 If you use the Facebook upload feature in Sparkbooth, you may have had problems signing into Facebook. 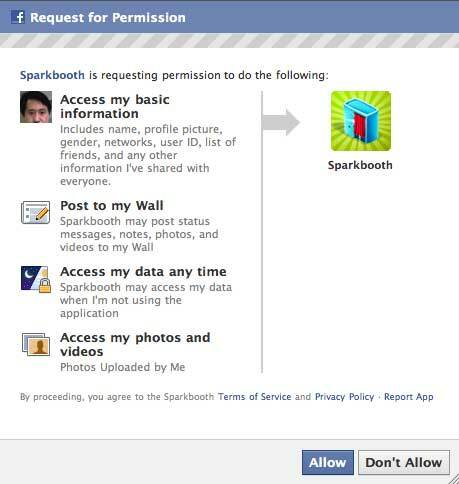 Facebook recently made a change causing the permission page to display a blank white screen in Sparkbooth. There is a work around and fix available. Paper and Cake have a great set of printable Valentine's Day photo booth props including signs, heart-shaped candies, lips, and more. 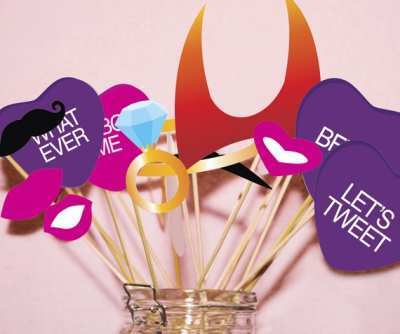 The Wedding Chicks have an online custom photo booth sign generator for weddings. 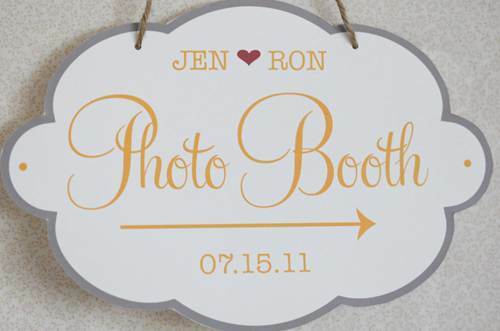 Just select some colors and fill-in the date and names, press the button and you get a stylish photo booth printable sign. Enjoy. Backup and upload photos taken by Sparkbooth into an online photo album. If you are offline during an event, Dropbox will wait until you are online and automatically upload the photos. 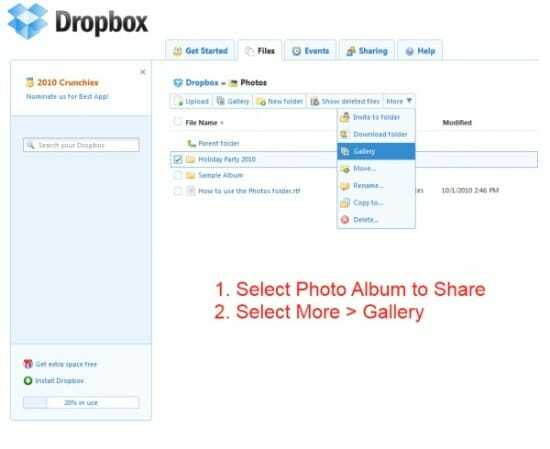 Sign up for the Dropbox service, and install it on your computer with Sparkbooth. The free account comes with 2Gb of storage space! Set Sparkbooth to save photos to the folder you created. Now as photos are added to the folder, Dropbox will automatically upload them into your online folder. If your computer is not connected to the internet, it will upload them later when it is connected. To share the photo album, go to Dropbox.com and sign into your account. Navigate to your Photos folder, and select the folder you want to share and press the Gallery button. This will generate a link you can email to your guests, so they can view the photos.